Like most Microsoft installations, ever individual’s experience installing the same piece of software can be very different. 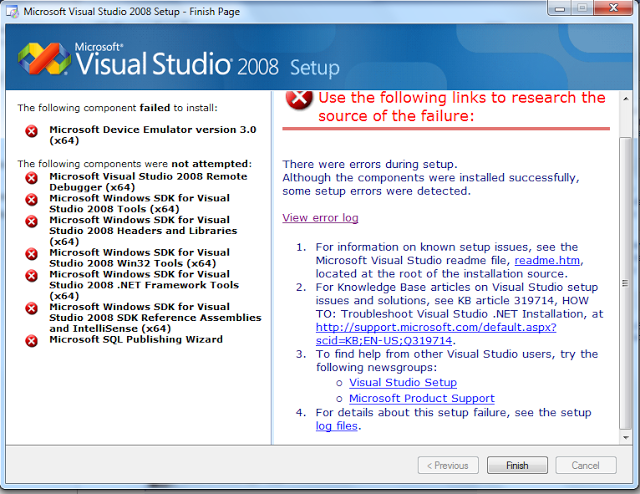 I must be special because I had particularly bad luck installing Visual Studio 2008. Only once did it install with no problems for me, but on many other occasions my instance would only partially install and leave out the most important part of the installation – the debugger! You know, the thing that makes Visual Studio worth using, the one thing that make Visual Studio King in the land of IDEs; aside from its other numerous achievements – the debugger is incredibly necessary in order to program effectively. Here is the dreadful Installer Screen of Death that I would encounter no matter what OS I installed it on. I installed this on XP, Vista and Windows7. I would install this from an ISO that I would mount on a virtual drive, not even a CD. I tried several copies and they all failed the same way.